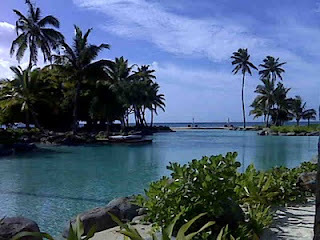 For the ultimate in luxury, romance, privacy and pampering, Laucala Island, Fiji is choice number one. A total of 25 villas, each hidden from the next, offers up the perfect hideaway for honeymooners seeking serious R&R in a setting that blends peacefulness with playfulness (think outdoor baths, huge wooden circular tubs, brightly colored rugs, handcrafted wood furnishings from Thailand, Fiji, Bali and beyond, as well as iPod docks, satellite TVs, fully-stocked bars & outdoor pools with separate living/dining space). Couples need never leave their villa if they desire; the 350-person staff is at your beck and call to deliver breakfast, lunch and dinner. Though, it’s highly recommended to check out the Beach Bar, Seagrass Asian restaurant, The Plantation House, not to mention the incredible spa (all have ocean views). And what’s more romantic than horseback riding on a private beach? Did we mention you can also get married on Laucala? There’s a wedding chapel on site and all paperwork/ceremonies can be completed within four days. It’s the perfect spot for a total destination wedding takeover, or a honeymoon a deux. Managers Thomas and Maja Kilgore will ensure you feel like part of the Laucala family from the minute you arrive. Another favorite property that oozes romance is Las Ventanas, in Los Cabos, Mexico. The chic setting (think lots of white against a backdrop of sparkling blue) coupled with stylishly designed, oceanview suites and an uber-friendly staff anxious to please and the recipe for romance is delivered without a glitch. There’s even a “Romance Director” on site who can pre-arrange special activities, private beachfront dinners, or even entire weddings. Bali is another beautiful destination where romance is in the air, at modern beach resorts like Amankila to the more traditionally designed, Ubud-based hotels like Amandari. A perfect getaway might combine stays at the two Aman properties, both totally different yet equally special in their own right. While at Amankila, wake up to views of the stunningly blue Indian Ocean and enjoy a private beach club with boating and other watersports at your disposal. In contrast, Amandari in the heart of Ubud offers an authentic taste of traditional Balinese village life in a charming setting that’s lush, green and within close proximity to temples, amazing hikes, local shops and restaurants. The female general managers of both properties go out of their way to ensure honeymooners receive extra-special treatment, and in these two unique settings, it’s not difficult to keep the romance alive. Last but not least, one of my all time faves in the Caribbean is Le Toiny in St. Barts. The property features just 15 private oceanview suites, each decked out with private pools, gorgeous furnishings, stunning views and access to the best restaurant on island (it’s here at the hotel). This is the kind of place you choose when peace and quiet top the list of priorities, as do top notch service, incredible cuisine, and proximity to the rest of a beautiful, beach-filled island. For more information on booking getaways, honeymoons or weddings at any of the above resorts, contact Elite Travel International at 310 979 9036 or via email stacy@elitetravelinternational.com. All clients of Elite Travel International receive the best possible rates as well as many exclusive VIP perks and value added amenities at each of these properties. This is really interesting take on the concept. I never thought of it that way. I came across this site recently which I think will be of great use http://www.thetravelhavenonline.com/ . Have a look! Really your thought will be a great mainstream for those who are looking for Vacation To Costa Rica. As it sounds very good though i would like to light it at the wall of my facebook. Top 5 picks for luxury stay-cation packages for parents in three of our favourite categories luxe Urban Retreats, luxe spa getaways and Short road trips that will make you feel like you are miles away. It is one of the fastest growing luxury travel agency in Milwaukee which give you travel services from luxury accommodations to luxury cruises. Thanks a lot! Now I have another favorite spot to stay. Thanks for sharing this. Me and my family are actually looking for another place to visit. We went for some Vanuatu accommodation last year and this one is another good target.